Solid, Strong and Colorful Push Retractable Throw a promotional party! 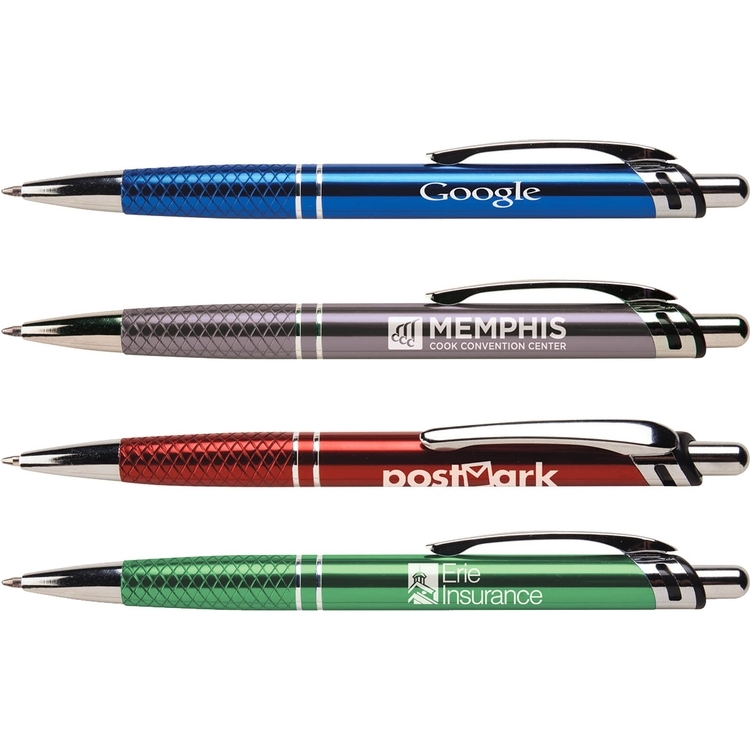 Printed with your name, logo, or custom design, the solid and strong push-action retractable Mardi Gras® pen features distinctive silver accents and your choice of hot and stylish barrel colors. For best results, the recommended imprint colors are black, silver, and white. Jumbo barrel in vivid brights with a generous imprint area. Shining chrome cigar band trim sets off imprint. Dimpled charcoal gray rubber grip provides writing comfort. Super smooth black ink. Liquid highlighter. 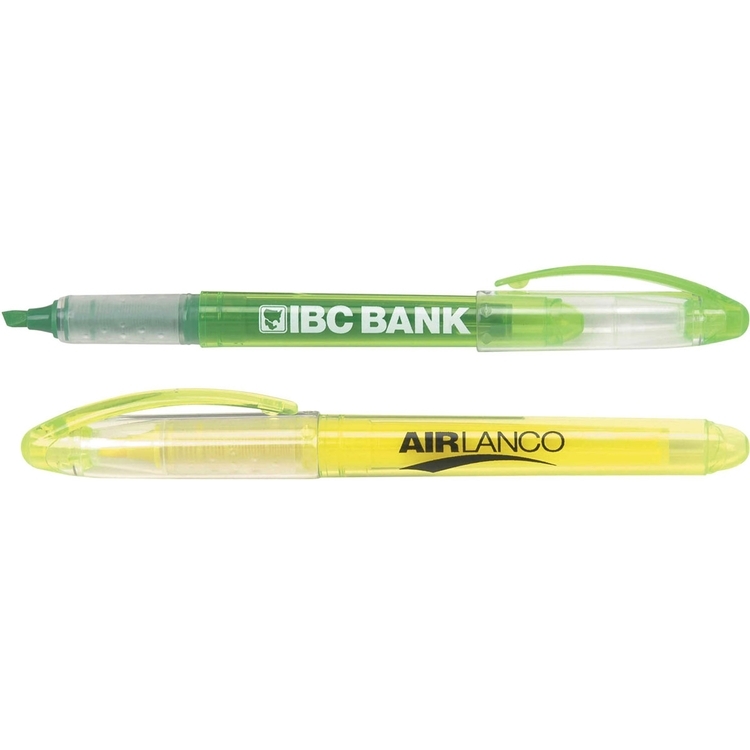 The highest quality nib ensures a smooth ink lay-down and easy highlighting. Quick drying and odorless neon colors with a large imprint area. Ink matches pen color. Vibrant colors with chrome band and tip. Sleek ergonomic design and tapered textured grip for writing comfort. Supersmooth writing black ink. 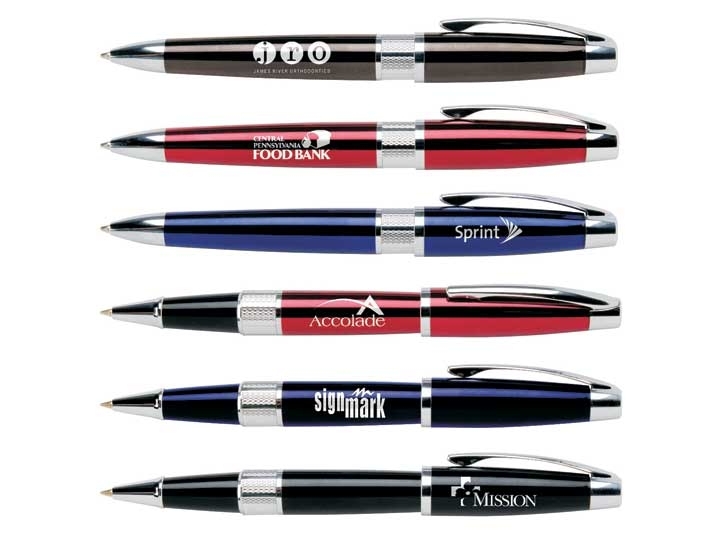 Enamel look corporate colors with shining silver accents for an executive pen look. 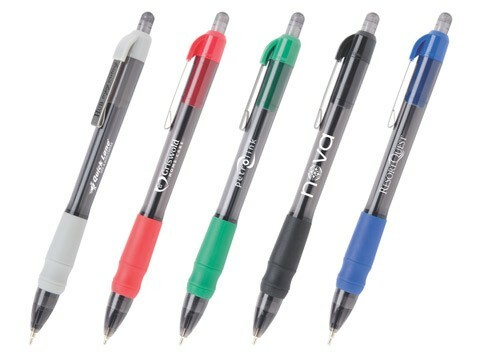 A generous ribbed grip and smooth black ink provide writing enjoyment. 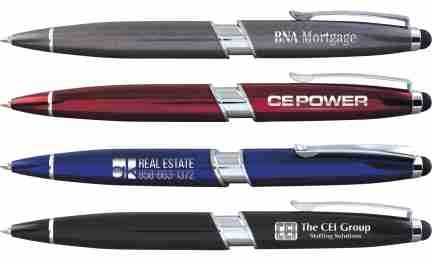 Handsome wide body executive pen with unique retraction and handy stylus tip. High gloss enamel and bold chrome clip and accents. Strong click retraction. Dazzling white barrel accented by bright colors and chrome accents. Matching translucent clip and ribbed grip. Smooth writing blue ink. Art Deco inspired lines and etched chrome accents for classic elegance. Rich enamel graces a generous barrel crowned with a micro-fiber mesh stylus designed for ultrasensitive connectivity with smartphones and tablets. Bold ink-laydown in intense black provides a high-end writing experience. 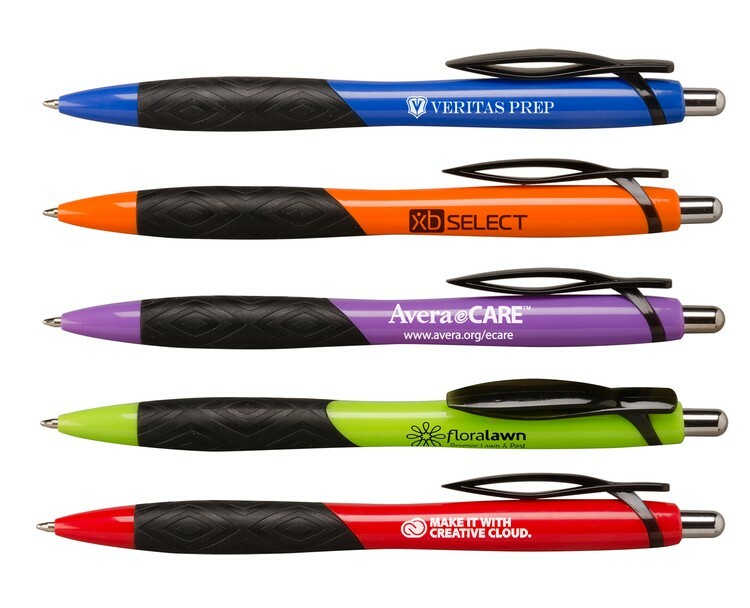 Eye-catching promotional pen with unique details and a budget price. The vibrant translucent brights contrast nicely with the bold silver trim. Features a jumbo ergonomic shape and grooved black rubber grip made for writing comfort. Includes a Hub branded silver band. Patent Number D825,663. 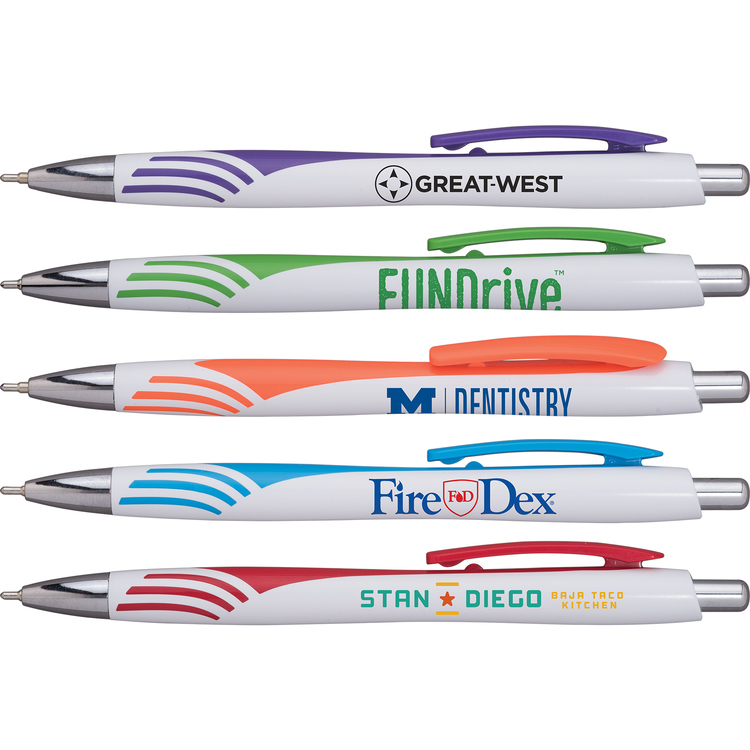 Eye-catching promotional pen with unique details and a budget price. Vibrant brights contrast with contemporary black and brushed silver accents. 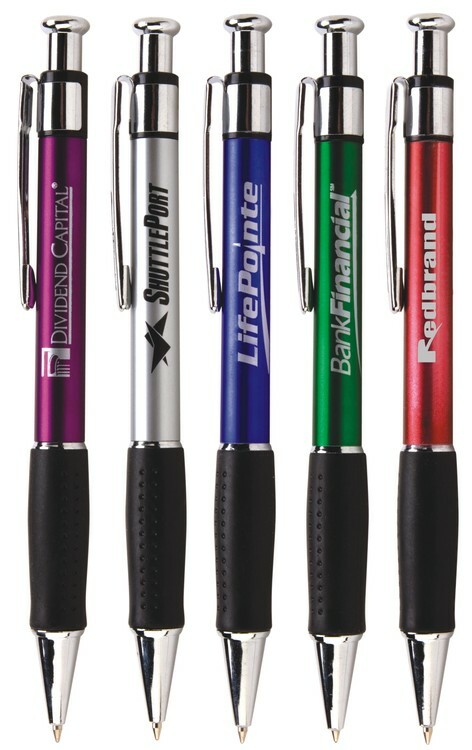 Jumbo ergonomic shape and textured rubber grip for writing comfort. High perceived value at a budget price. 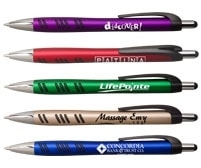 Eye-catching promotional pen with unique details and a budget price. Rich shimmering metallic contrast with glossy black trim. 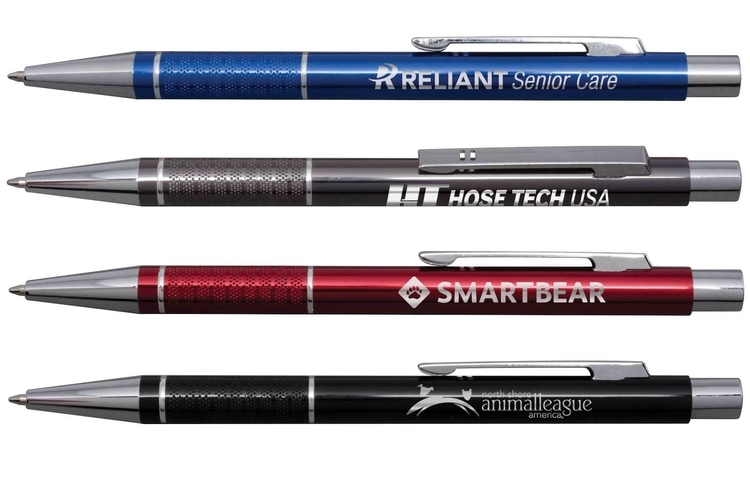 Ergonomic shape and notched grip provide exceptional writing comfort. Double injected rubber grip features hexagons in 8 vivid colors. Glossy black and silver trim contrasts with bright white barrel. Guaranteed ultrasmooth writing cartridge in blue (default) or black ink. Patent number D709,951. 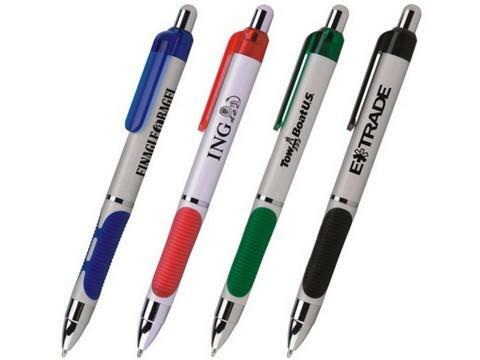 European styled executive pen in fashion colors with shining silver accents. Classic chrome accents and strong click retraction for high end appeal. Sleek shape and knurled textured grip for writing comfort. Supersmooth writing blue ink. Sleek lines and fine detailing for high end appeal. 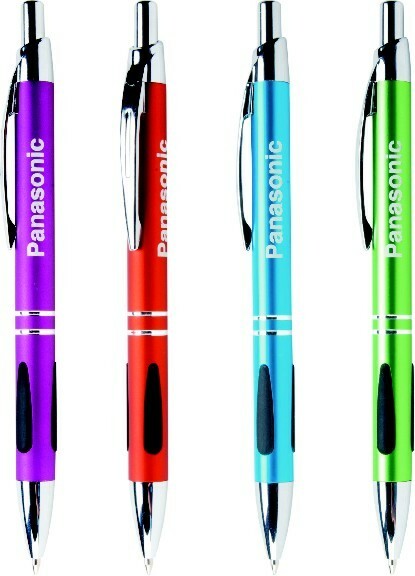 Glossy rich colors combine wth shining silver accents and a diamond etched grip for a nautical look. Sooth writing black ink for writing comfort. 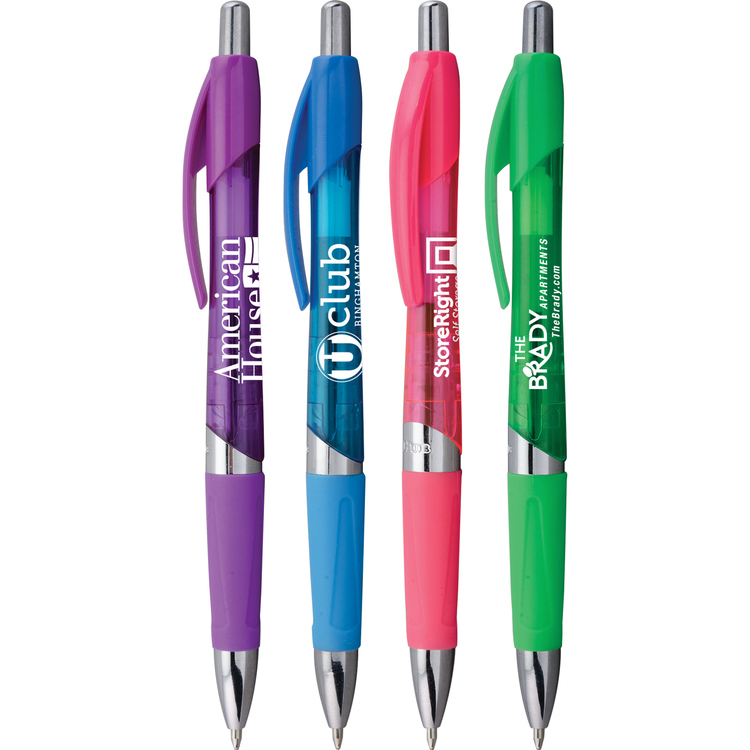 Vivid metallic brights and handy stylus tip make this promotional pen stand out. 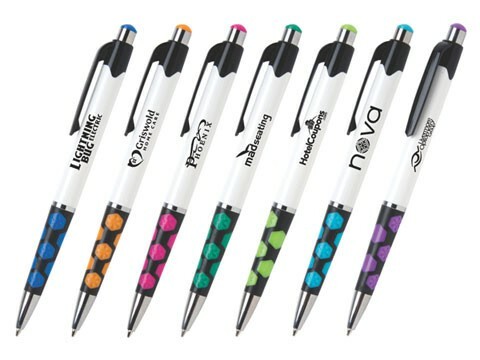 A contoured barrel with patterned black accents fits perfectly in the hand and the vivid colors make a bold statement. 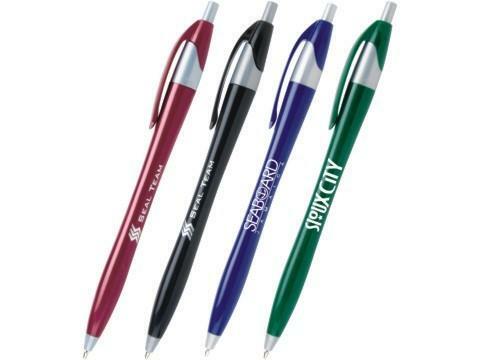 This Vienna Executive Pen upgrade features the latest in writing enjoyment. A rubberized finish for added comfort no matter where you grip, teardrop grippers, and smooth writing black ink add to the truly tactile writing experience. The engraved silver imprint and shining trim contrast boldly with matte colored finish. 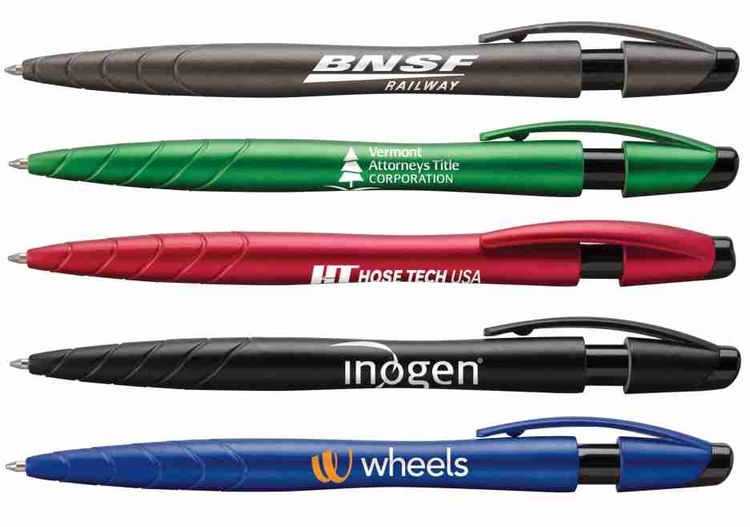 An economical price and anti-fraud ink make this a perfect pen for many fields. 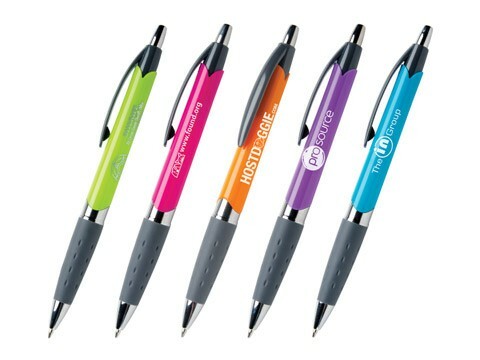 Fun and functional with a handy stylus tip specially designed for increased conductivity for better interaction with your tech devices this is one promotional pen they’ll never want to let go of. Crisp white barrels with classic colored trim to frame your imprint simply. Available in your choice of blue or black ultra-smooth writing ink. Patent Number D709,949. Part of the Cambridge Collection. 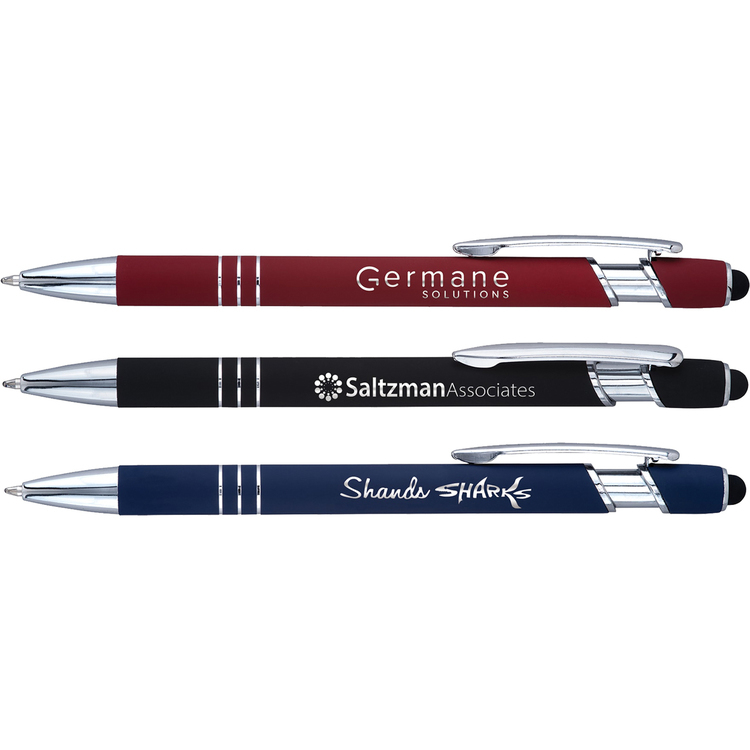 Jumbo executive pen in high gloss enamel with silver accents and engraving and a gunmetal barrel etched in a contemporary Guilloche engraved design. 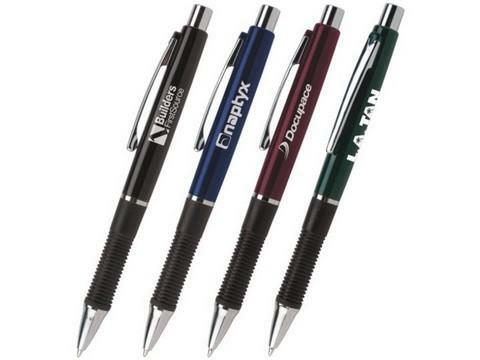 Twist action ballpoint with supersmooth writing black ink. 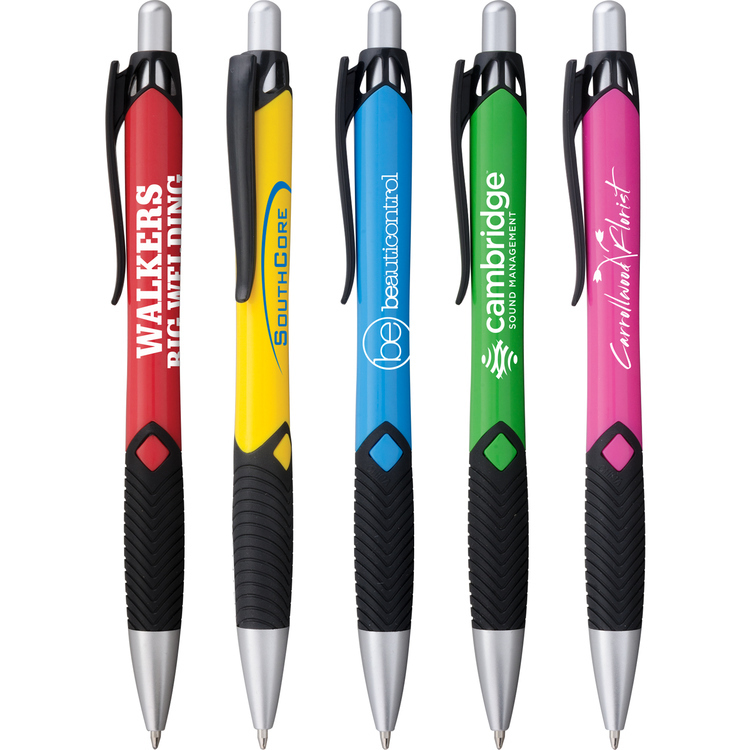 Cambridge Collection lifetime guarantee. 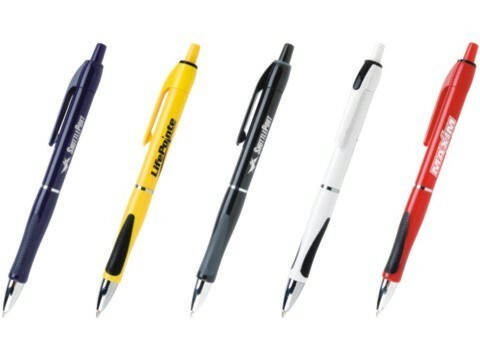 Experience extreme writing enjoyment with this ultra-modern pen. 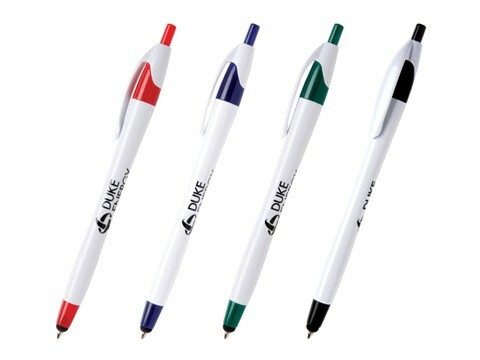 A sleek white barrel is accented by vivid trim while grooved grippers and hybrid ink increase writing enjoyment. 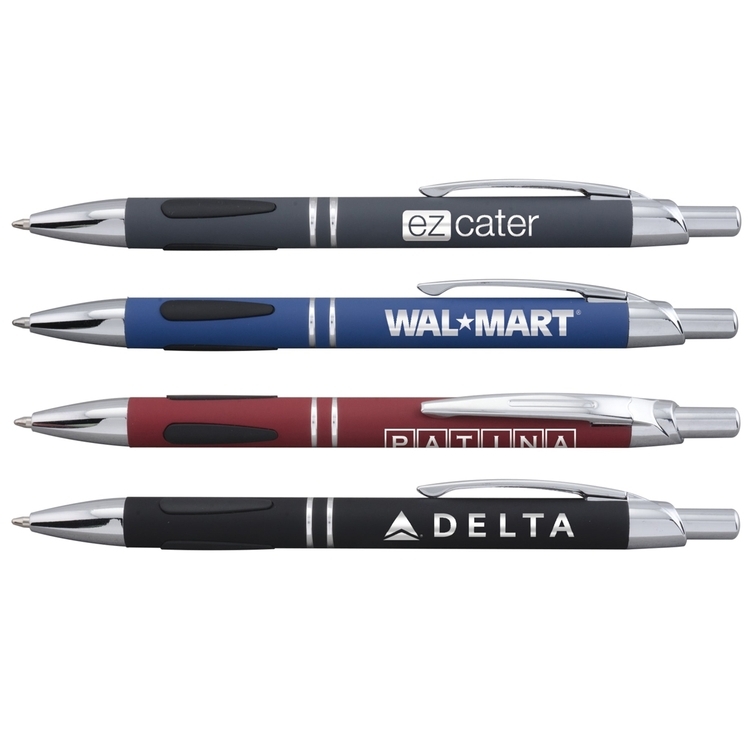 Solid and strong push action retractable ballpoint pen in executive metallic colors with silver accents. Black rubber comfort grip for writing ease. 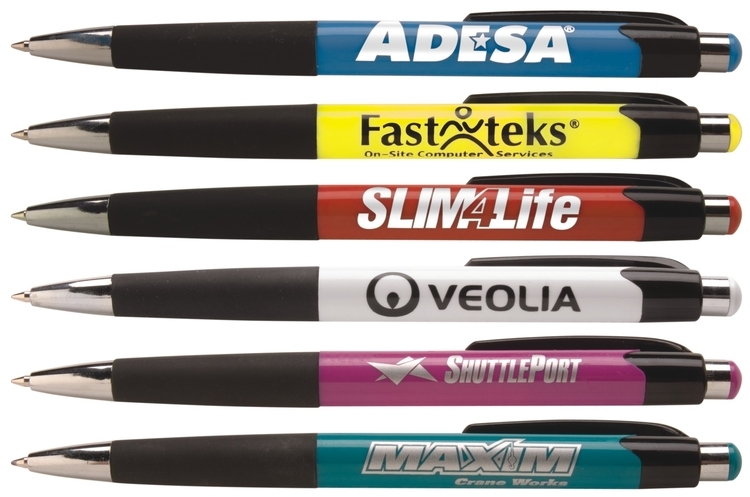 Guaranteed ultrasmooth writing black ink. Frame your message with vivid stripes in fun fashion colors. 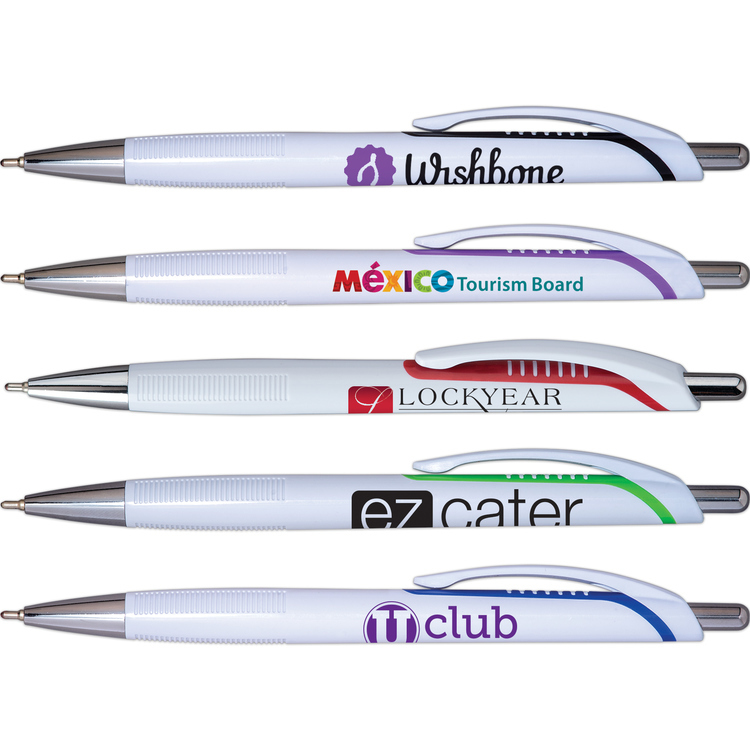 Featuring a generous imprint area and full color option to make your imprint really roar. 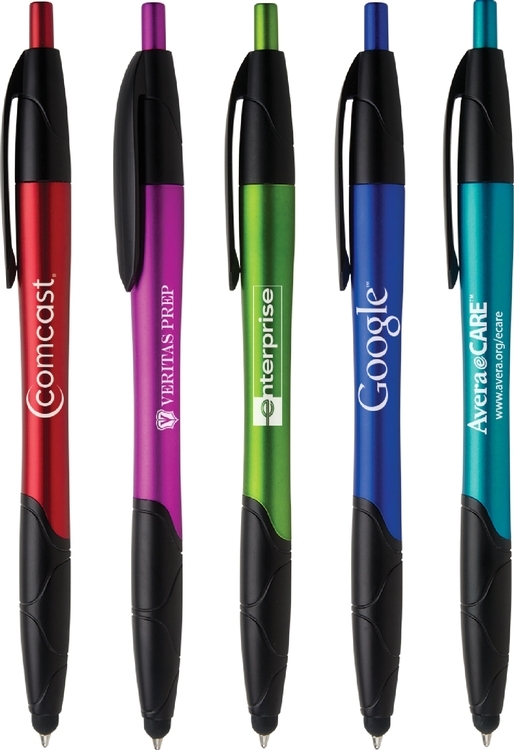 Black hybrid ink makes this pen one they will want to hang onto. Part of the Cambridge Collection. 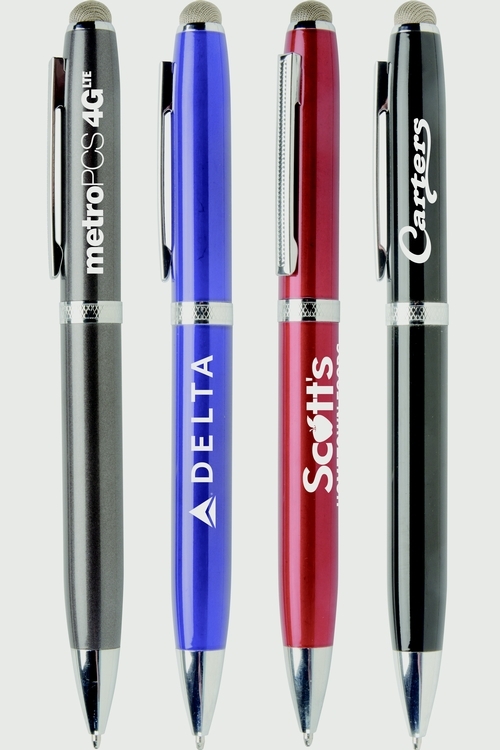 Jumbo executive pen in high gloss enamel with silver accents and a Guilloche engraved center band. Twist action rollerball with supersmooth writing black ink.  Cambridge Collection lifetime guarantee. Sleek European styling in brushed vibrant colors. Shining silver trim and black raised teardrop grippers add style and comfort. Black ink. Vibrant brights with sculpted ribbon-look clip and textured grip. 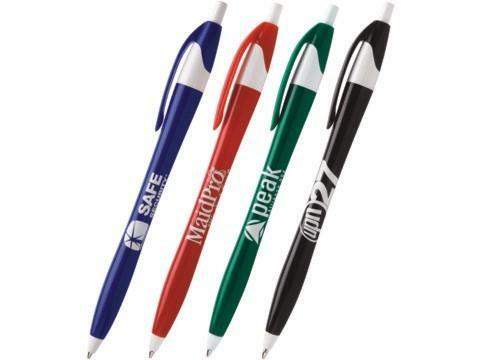 Ergonomic barrel with jumbo rubber grip for writing comfort. Perfect price point for the hospitality industry. Smooth black writing ink. 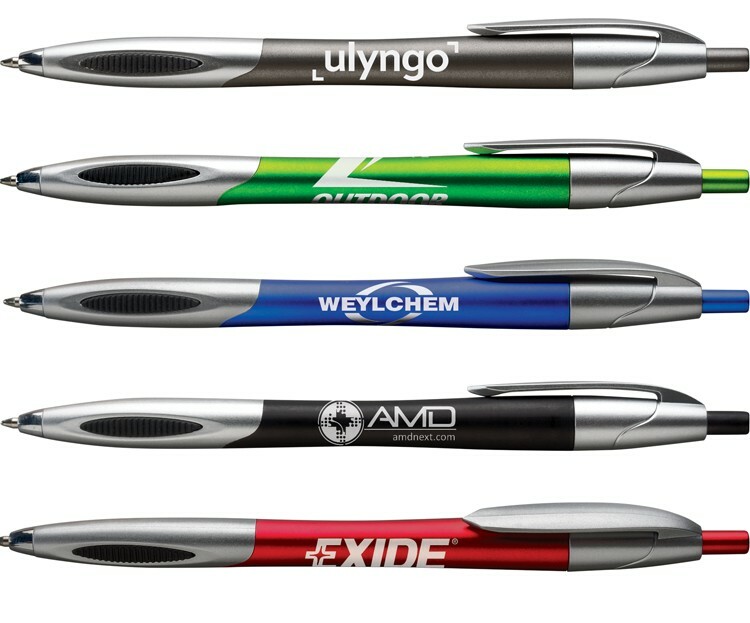 Ultramodern stylus pen is sleek and stylish. Rich shimmering metallics contrast with matte black and shining silver trim. Jumbo hourglass shape and rubber grippers provide exceptional writing comfort. Smooth writing black ink.